It takes focus, openness to innovate and stamina to manage over 400 buildings in more than 70 countries. Matthias Grimm is VP and Head of Global Real Estate & Facilities at SAP (GRF) and he has all of the above. He has been a driving force behind SAP’s GRF organization for over 16 years. 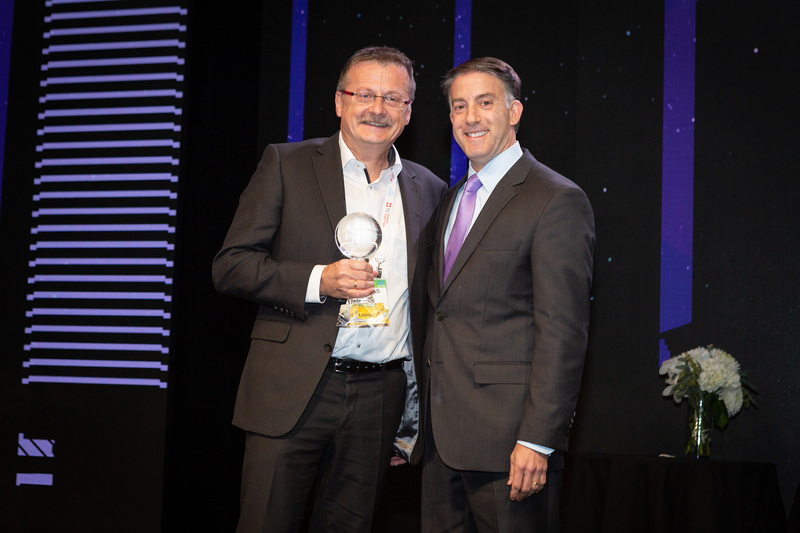 The corporate real estate association CoreNet Global acknowledged Matthias’ efforts and accomplishments by recently naming him “Corporate Real Estate Executive of the Year”. The title honors his contributions to the company’s success, his achievements in elevating Corporate Real Estate (CRE) and his role as a CRE leader. Matthias’ job profile requires some explanation. He not only leads the SAP location strategy with office buildings around the world, but he also manages the expectations of over 95,000 SAP employees. The relationship to those employees is especially dear to his heart. That said, Matthias refers to the great non-financial impact of CRE on the business. Workspaces that are designed according to employee needs will increase productivity, capability to innovate and overall, wellbeing. However, there has to be a balance between employee demands and budget targets, of course. “Real Estate & Facility cost are in many cases the second largest expense on a company’s balance sheet, so being conscious of the budget is a must,” he says, but adding that employee feedback is valued and that his team is not designing new workspaces in isolation. The business supports this human-centered approach, reflecting the collaborative angle of Corporate Real Estate Management with HR, for example. This partnership makes sense because the overarching goal is to attract, motivate and retain employees. Hiring and retaining employees can be expressed in KPIs and contribute to a winning strategy for Matthias’ GRF team and the company as a whole. Matthias contributes to software development at SAP with his experience in corporate real estate. The SAP real estate team is constantly improving its application called SAP Cloud for Real Estate. This is a strategic financial cloud application that provides centralized information for an organization’s corporate real estate portfolio. Matthias is an important sparring partner for the product team, where he tests the solution frequently. “Collaboration is part of my job. If I can help our product team build a modern real estate management software that helps CRE professionals manage the cost efficiency of their real estate portfolio and improve employee productivity, then count me in,” he says.